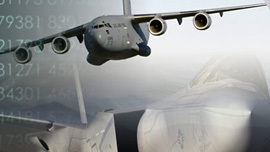 The Network-Centric Solutions-2 (NETCENTS-2) contracts provide the Air Force with a primary source of netcentric and IT products, services, and solutions. NETCENTS-2 Application Services is a multiple award indefinite delivery, indefinite quantity (ID/IQ) contract with the US Air Force to provide Information Technology Services with ceiling value of $960 million. The NETCENTS-2 contracts are designed to meet challenges through the purposeful and dedicated use of innovative business practices that establish relationships between the Government and industry. The NETCENTS-2 IDIQ contracts provide a wide range of IT Network-Centric and Telephony products, services and solutions covering the full spectrum of netcentric operations and missions. This includes existing legacy infrastructure, networks, systems, and operations as well as emerging requirements based on the Air Force Chief Information Officer’s (CIO’s) Service Oriented Architecture (SOA) construct. The contracts will provide Network-Centric Information Technology, Networking and Security, Voice, Video and Data Communications, and System Solutions Services to satisfy the Combat Support (CS), Command and Control (C2) and Intelligence Reconnaissance and Surveillance (ISR) Air Force and Department of Defense (DoD) requirements worldwide. These contracts provide users the capabilities to find, access, collaborate, fuse, display, manage and store information on the DoD Global Information Grid (GIG). Air Force sites may include commercial-off-the-shelf (COTS) National Security Systems (NSS), intelligence data handling equipment, C2 equipment, Local Area Networks (LAN), Wide Area Networks (WAN), secure and non-secure video, voice and data systems, and/or mission equipment. The equipment processes information of varying security classifications and may include sites that are Sensitive Compartmented Information Facilities (SCIFs).